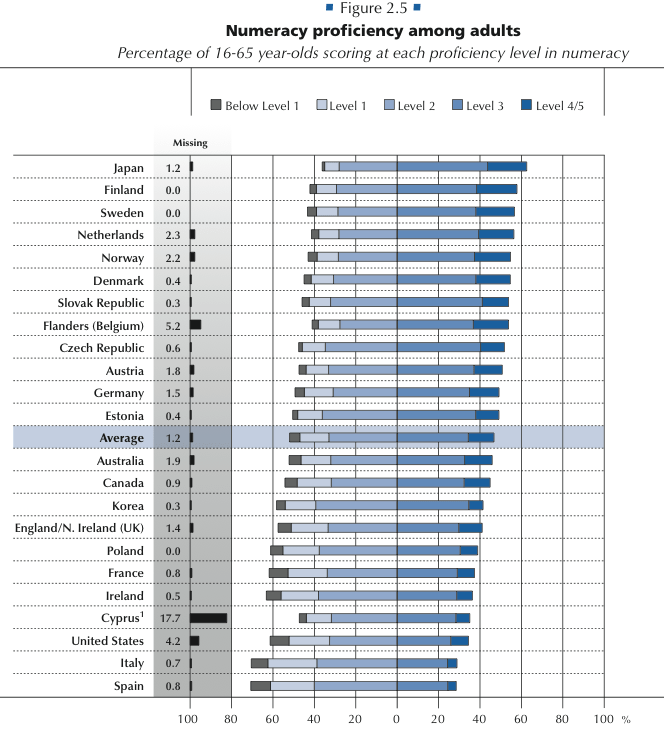 Data from the OECD skill survey of adults. Considering adults in the age range: 16-65. 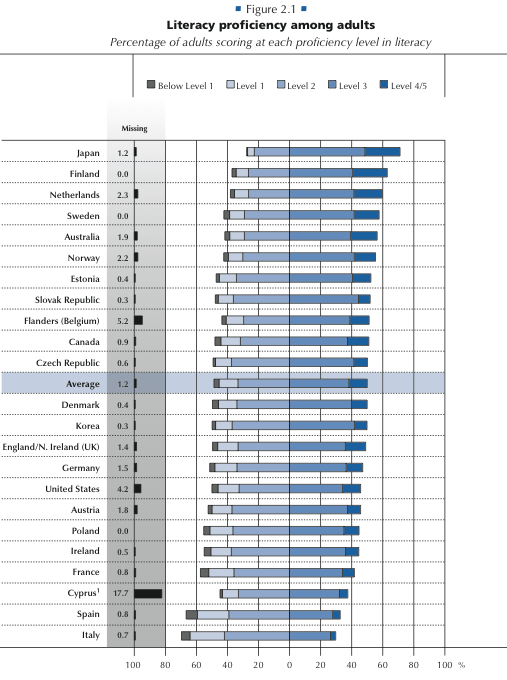 We are not talking of PISA tests. These are not just pupils. Basically, too many people cannot understand written instructions and cannot perform a simple calculation (for example, the interest on their mortgage or their savings account). Anyway, even adjusting for the level of education, people in the age 16-24 perform better at tests than those in the age 55-64. A whole bunch of new written media outlets have arrived. All experimenting with different business models (subscriptions, donations, sponsors, advertising, conferences, etc). No surprise: none seems to really work. Frankly, trying to guess who’s gonna make it is almost as much fun as reading them. In Italy? Il Post and Linkiesta are the ones I prefer, but basically they are web-only newspapers, betting on advertising. As usual, very little experimentation here. A few one man shows in the US are thriving. The more specialized the better. Mainly monetising with consulting, books, venture deals. Again, almost nothing of the kind in Italy. How many felonies was Martin Luther King, Jr., convicted of? King, whose motives were political too, but who, unlike Aaron, triggered actions which caused real harm (as in physical damage). Two bogus charges (perjury and tax evasion) from Alabama, which an all-white jury acquitted him of. This is a measure of who we have become. These are basically data following a Post Christmas-party discussion. From the World bank database, GDP growth in the last 20 years in Italy, Germany, France, US, Euro Area. As can be seen, Italy has almost always been the worst performer, the “Maglia nera“. My argument is simply that it is not a matter of left and right policies, or of left and right political figures. I am choosing a 20-year time span for a reason: In the last 20 years we had for about 10 years a “centre-left” administration, and for 10 years a “centre-right” administration. Can you see the difference in the data? I can’t, since both in good and in bad times we have lost growth opportunities. For full disclosure, I have voted for the “centre-left” coalition in the last 20 years. Frankly, it was a no-brainer. Anyway, data show that centre-left and centre-right have no clue on how to restore growth in the Country, or in a region, or in a city. And in the few cases in which they have a small clue, they have no courage (this addition is my opinion, not embedded in the data, so it might be wrong). I just found the name of a sickness I have. I knew I was not the only one, but I now have a confirmation, and I am relieved. Michael Crichton, in a great 2002 speech at the International Leadership Forum, called it “Gell-Mann Amnesia”. It was actually his invention, and name of a Nobel prize only served to confer imore authority to the malaise. To me is therefore Crichton Amnesia. So, I suffer from Crichton Amnesia. These are the symptoms, in four steps. I read a newspaper article, or listen to some news on the radio or tv on a topic I know in detail (for example, something related to physics, EE, research, academia). I realize than the author/speaker has no understanding of what he/she is describing and of what really happened. He/she does not put any effort, and swaps cause and effect. I decide that journalists are totally unreliable, and that one should never believe what they say. A few seconds later, I forget my resolution, and I start reading or listening very carefully the next piece, on a topic I have no direct knowledge of, such as Middle East, the financial crisis, China, the prison system, and millions of other things. Indeed, it is amnesia. I tried to cure myself in 2012, following as little news as possible. Going to the original sources, when the news was really important and time allowed. But my complete recovery is still far away, and the cure will take a lot of time and effort.